to our enewsletter and stay up to date with the latest and greatest BullsEye news! 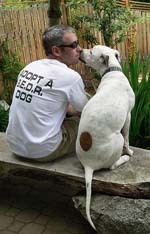 Adopt a BullsEye Dog and find true love! Looking to adopt one of breed ambassador dogs? Please fill out our ONLINE APPLICATION as the first step in our process. Our screening process, for the dogs we sponsor AND the homes we adopt to, is very rigorous. We want to ensure that our dogs land in forever breed ambassador homes. BullsEye dogs represent the best of the breed: confident, athletic, loving, and outgoing. Our adoptive homes represent the best of dog owners: breed knowledgable, committed, caring, and compassionate. To better understand what we expect out of our adoptive families, please take a moment and preview our adoption contract here.